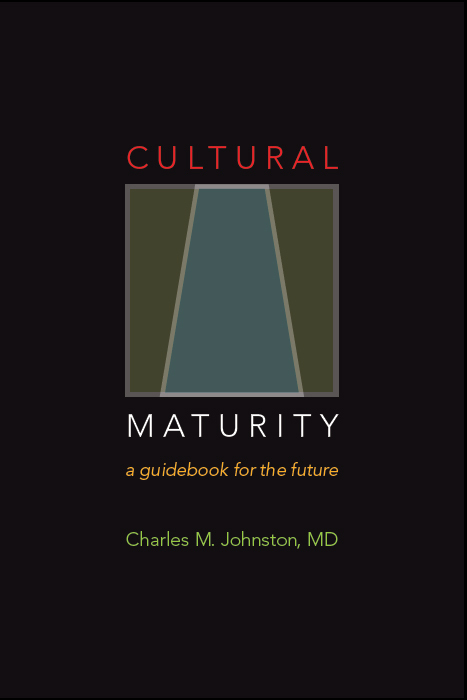 The recognition that culturally mature perspective “bridges” common polar assumptions points us toward a simple, yet powerful comparison tool. Ideas that don’t successfully “bridge”—and there are lots of ways this can happen—necessarily stop short of the needed maturity of perspective. Creative Systems Theory provides a framework for making highly detailed polar trap distinctions. But a more general kind of “polar trap” observation provides a useful and compact compare-and-contrast language for teasing apart ways our thinking may go astray. We can divide the various ways we fall off the systemic roadway in our thinking into three basic types of polar fallacies, what Creative Systems Theory calls Separation Fallacies, Unity Fallacies, and Compromise Fallacies. We can lose our way by falling off the right side of the road, by falling off the left side, or by straddling the white line in the middle. 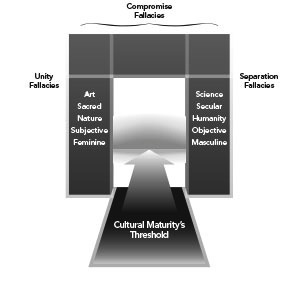 Separation Fallacies identify with the archetypally masculine, They fall off the right side of the conceptual roadway. They equate truth with difference—with perceived fundamental distinctions such as between men and women, the material and the spiritual, the intellect and the emotions. And they give greatest value to the more creatively manifest side of the pertinent polarity (here, men, the material, and the intellect.) Some common Separation Fallacies: We are each wholly unique, individual. Experts have the answers. Final truth is what can be rationally articulated and objectively demonstrated. Man is wholly separate from nature and has rightful dominion over her. Change is a simple product of cause and effect. Unity Fallacies identify with the archetypally feminine. They fall off the left side of the conceptual roadway. Related Unity Fallacies might include: In the end, we are all one (differences are ultimately irrelevant). The ordinary person knows best (better than leaders and institutions). Final truth is what we know from within. The task is to always live in accord with nature. Everything happens for a reason, even if that reason remains mysterious (it is all connected). Unity Fallacies argue against distinction and emphasize oneness. They may claim a transcendence of polarity, but in fact they very specifically take sides. They give their allegiance to the softer, more creatively germinal hand of creation—to the spiritual over the material, feelings over facts, the timeless over the specific. Compromise Fallacies split the difference. A few related Compromise Fallacies are: We are all different in our own ways (“different strokes for different folks”). Good decisions come from everybody having an equal say. There are lots of kinds of truth and each has its merits. Nature can be different things to different people. In the end, life is what we make of it. Some Compromise Fallacies advocate a safe additive middle ground. Others argue correctly for multiple options, but give us nothing to help us beyond this accurate but meager observation—they claim to address diversity but fail to address what makes differences different. Compromise fallacies take us beyond black and white, but in the end replace it only with shades of gray. These are shorthand concepts. For starters, no one type of fallacy is as distinct from the others as the labels might suggest. For example, Unity Fallacies commonly carry a hidden Separation Fallacy, and Separation fallacies similarly a hidden Unity Fallacy. A person who sees his own group as chosen and a conflicting group as evil succumbs to a Unity Fallacy with regard to his compatriots and a Separation Fallacy in relation to his adversaries. In addition, there are in fact many versions of each type of fallacy. 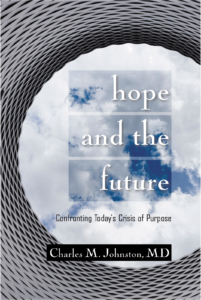 Some are going to be common with certain personality styles and specific views of the future, some with others. We can talk, for example, of multiple, very different kinds of Unity Fallacies. We often see a particularly spiritual sort of Unity Fallacy with advocates of New Age or back-to-the-land philosophies. But we also find very different Unity Fallacies with more fundamentalist religious beliefs that ally with “family values” and polarize against moral relativism and intellectual elites. Different yet are the more intellectual Unity Fallacies common in academic and liberal thought, which side with the underprivileged and polarize against conservatives and corporations. Later, we will use the Creative Function to tease apart these different types of Unity Fallacy and to clarify why we predictably find them where we do. When we encounter one of our three basic kinds of fallacies, what we see may be a product only of momentary misunderstanding, but more often it reflects underlying psychological/cognitive pattern. If we are vulnerable to polar traps, we will tend to fall for the same general sort of trap whatever the question we consider.